The Department of Electrical and Electronics Engineering was started in the year 2008 with very good facilities to meet the needs and challenges of Electrical Engineering. This branch exposes the students to the variety of fields including electrical, electronics, mechanical, civil and computer engineering. This enables the students to become perfect engineering in the field who can work on various developments in today's competitive environment. The vision of the Department of Electrical and Electronics Engineering is to establish the department as a leading light in the area of Electrical Engineering. To Impart Knowledge in Electrical and Electronic Engineering (EEE) to meet the international standards and make the Electrical Engineering ethically and emotionally strong enough to meet the technological challengers for the well-being of this country in the coming years. To provide students with the fundamental knowledge, interdisciplinary problem solving skills, social awareness and confidence required to excel in their chosen professions. To maintain a collegial, supportive and distinct environment that encourages our students and faculty to achieve the best of their abilities. The department of Electrical and Electronics Engineering is a field of engineering that generally deals with the study and application of electricity, electronics and electromagnetism. Electrical engineering deals with the problems associated with systems such as electric power transmission and electrical machines. The department is regularly organizes technical lectures, seminars and workshops to bridge the gap between the syllabus and current practice, thereby the industries and institutions. The department has a committed, highly experienced and motivated team of faculty members. The aim of this lab is to provide exposure to the students with hands on experience on various basic engineering practices in Electrical and Electronics Engineering. The main objective of this lab is to give practical hands on exposure to students in the measurement of electrical quantities like voltage, current, power, power factor energy, resistance and various wiring circuits. The aim of this lab is to expose the students to the operation of D.C machines, A.C machines and transformers and give them experimental skill. The main objective of this lab is to study the performance of open circuit and short circuit characteristics and various types of load test. This lab also used to train the students in the measurement of displacement, resistance, inductance torque and angle etc., and to give exposure to AC, DC bridges and Transient measurement. The aim of this lab is to supplement the theoretical knowledge gained in Power electronics with practical testing for analyzing the various characteristics of power electronic devices. This lab would enable the student to have a clear understanding of the types and operation of converter, inverter, rectifier, and chopper. This lab is used to provide sound knowledge in the basic concepts of linear control theory and design of control system. To understand the methods of representation of systems and to desire their transfer function models. To provide adequate knowledge in the time response of systems and steady state error analysis. To accord basic knowledge in obtaining the open loop and closed–loop frequency responses of systems. To understand the concept of stability of control system and methods of stability analysis. 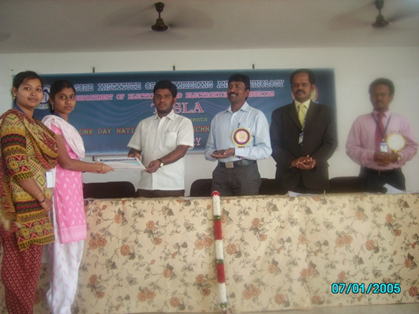 Department of Electrical and Electronics conducted one day national level technical workshop on 7th march 2012 for EEE students in seminar hall. The Chief Guests were Dr.S. 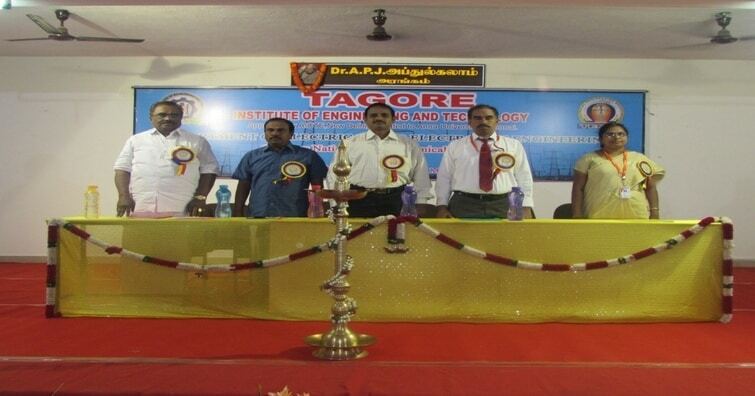 Thangavel Prof & HOD / EEE KSR College of Technology- Thiruchencode & Er.M.Ravirajan.AEE Mettur thermal power station. 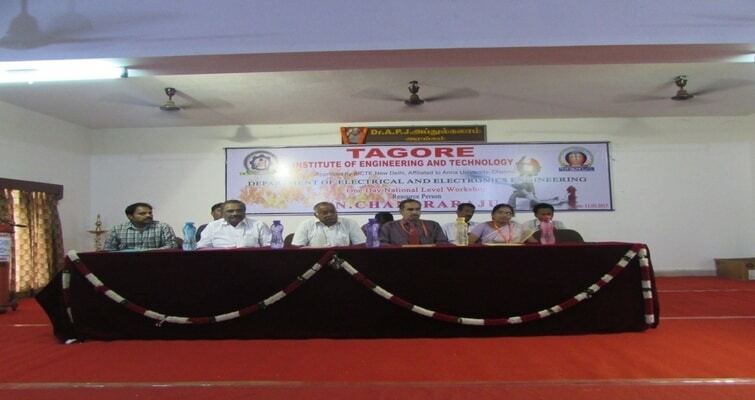 Department of Electrical and Electronics Inaugurated Association Inaugural Function on 8th march 2013. The Chief Guest was Mr.P.Renganathan AEE - TNEB 230/110 KV Sub Station- Deviyakurichi-Attur. Department of Electrical and Electronics organized one day national level technical workshop on 1stseptermber 2013. 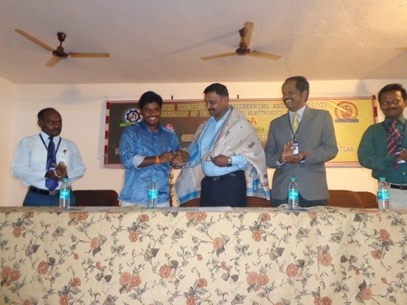 The Chief Guest was Dr.M.Muruganandam, M.E, PhD., MIEEE,MISTE PROF & HEAD. Department of Electrical and Electronics organized one day national level technical symposium on 22ND february 2014. 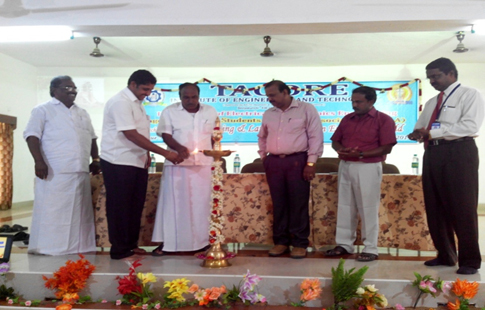 The Chief Guest was Dr.M.Sethil kumar M.E,PhD., PROF/EEE Sona College of Technology, Salem. Department of Electrical and Electronics conducted technical seminar on 3rd septermber 2014. 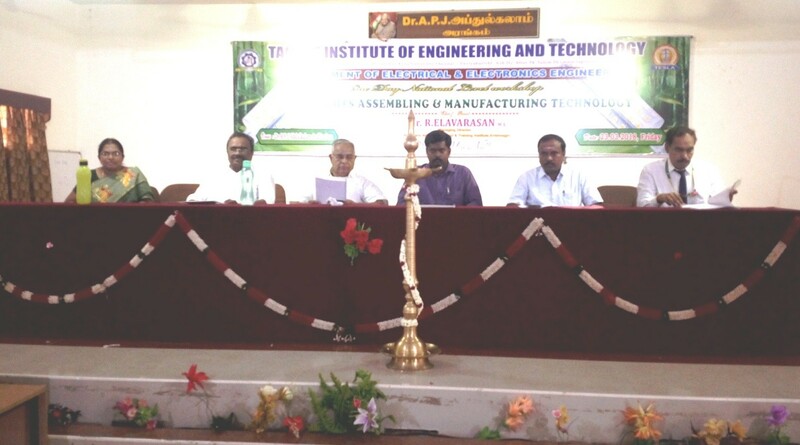 The Chief Guest was Mr.R.Shanmugam, M.E., EX. dalmia cements, General manger on electrical and mechanical. The Department of CSE, ECE and EEE were conducted Association inaugural function on 19.08.16. The president Thiru.R.Lakshminarayanan, vice president Thiru.R.Chinnusamy, Secretary Thiru.K.Arunkumar, Joint secretary Thiru.R.Muthusamy, treasurer Thiru.Kaliyanan, and Educational Committee Members Thiru.R.Paramasivam, Thiru.Kootroad .N.R.Palanivel were presided over the function. The Principal Dr.S.Senthilkumar delivered excellent speech on Future implementation of advanced technologies in Engineering field. The chief guest Mr.G.Tholkappia Arasu, AVS college of technology, Salem presented a brief lecture on development of Communication Skills and job opportunities in present scenario. The Head of the department Ms.S.Jayanthi introduced all the office bearers of the association in the academic year. The HODs from various department, Professors, Assistant Professor, Lab technicians and students were participated in this event. The department of EEE organized one day Workshop program on “Hands On Training In Matlab” on 19th September 2016. The chief guest Mr. A.Karthick, Marketing Executive, S.Poovzhi, Project Engineer. Uniso System India(P) Limited Salem. Our department has organized two days guest lecture on 24.09.2016 and 01.10.2016 and on the topic “Microprocessors and Microcontroller”. All the third year students of EEE were participated in this seminar. Resource person Mr.V.Vijaykumar Assistant Professor, Dhanalakshmi Srinivasan Engineering College, Perambalur. Our department has organized one day guest lecture on 18.10.2016 on the topic “Electromagnetic Theory”. All the II year students of EEE were participated in this seminar. Resource person Mrs.A.Vasanthi, Assistant Professor/EEE, KSR College of Engineering, Tiruchengode. Our department organized One Day National Level Technical Symposium “TESLA 2K17”on 10.02.2017. The inauguration function was started at 10.00am sharply, with a warm welcome address given by Ms.S.Jayanthi, Head of the Department (EEE). Our Joint Secretary Thiru.R.Muthusamysir deliverPresidential address and honoured the chief guest.Our Educational Committee Member Thiru.N.R.Palanivel felicitated the gathering. The principal Dr.S.Senthil kumar deliver the principal address. Our honorable chief guest Dr.N.Stalin presented an energetic and valuable speech to encourage our students for their betterment carriers in various Electric field and future. Our inaugural function was ended and the next session of paper presentation event started at 11.20am. Students from various colleges presented their papers in innovative topics in different areas like HVDC, energy efficient drives, Renewable energy sources and Recent Trends in Electrical Engineering etc., After the lunch the interesting events like circuit debugging, technical quiz were conducted. Students participated in these events with full involvement and made those events interesting. The valedictory function started at 3.30pm and the participants from various colleges gave their oral feedback regarding the function. Our Joint Secretary Thiru.R.Muthusamy sir and Dr.S.Senthil kumar Principal, TIET issued the prize and certificates to the winners of various events. Student SecretaryMr. V.Vignesh of Final year presented the vote of thanks. The department of EEE organized one day National level workshop on “Industrial Fire and Safety” on 11th FEB 2017. Our department staff Prof. K.Balasubramaniyan welcomed the gathering. The principal Dr.S.Senthilkumar deliver the principal address. Our Joint Secretary Thiru.R.Muthusamy Sir deliver Presidential address and honoured the chief guest.Mr.N.Chandraraju, Advisor, Sri Vijaya Fire and Safety Company, Trichy enumerated various causes of fire accidents, stages and types of fire. The important causes which include careless handling of fire by men, oil leakage and electricity leakage were discussed in detail. He also suggested the various safety measures and precautions to be followed for avoiding fire accidents. The way of handling the fire accidents, self safety, saving the lives and material in accident were clearly explained by the experts. The students involved greatly involvement and at the end of the session students clarified their doubts through interaction.At the end of workshop, Mr.C.Krishnakumar, Demo master - Sri Vijaya Fire and Safety Company, Trichy, demonstrated a fire accident in the ground, and trained the participants to handle the different types of fire extinguishers during fire accidents. Our department staff Prof. S.Subramanian presented the vote of thanks. Our department has organized one day guest lecture on 01.04.2017 on the topic “Design of Electrical Machines”. All the III year students of EEE were participated in this seminar. Resource person Mrs.N.Saranya, M.E., Assistant Professor / EEE, Dhanalakshmi Srinivasan Institute of Research & Technology, Perambalur. The Department student Association “TESLA” was inaugurated on 21st August 2017. The inauguration function was started at 10.15 am sharply, with a warm welcome address given by Ms. S.Jayanthi, HOD/EEE. The principal Dr.S.Senthil kumar deliver the principal address. He stated, “It is an association which inculcates in upbringing the EEE department and also setting up new ideas for the moral and intellectual growth of the students”. On this wonderful occasion President Thiru. R. Lakshminarayanan, Vice President Thiru. R. Chinnusamy, Secretary Thiru.K.Arunkumar, Joint Secretary Thiru.R.Muthusamy, Treasurer Thiru. Kaliyanan, the Educational Committee Members Thiru. R. Paramasivam, Thiru.Kootroad. 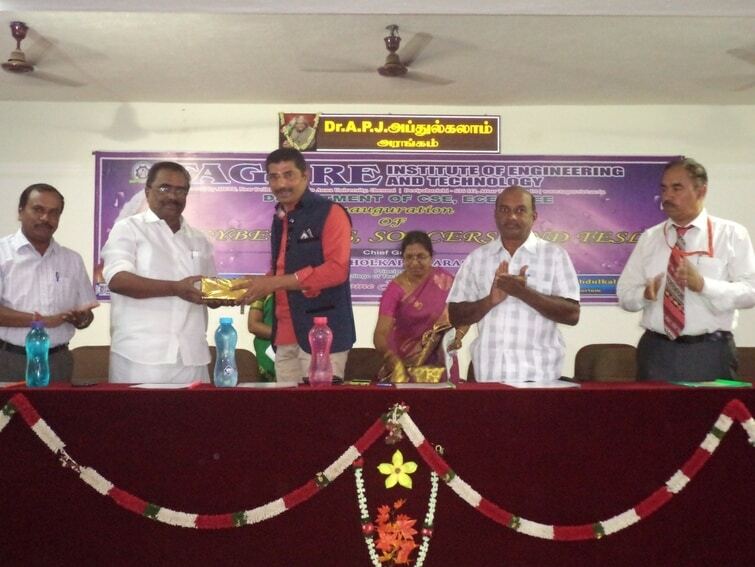 N. R. Palanivel were presided over the function. The Principal Dr.R.Vasanthi HOD/CSE introduced the chief guest. 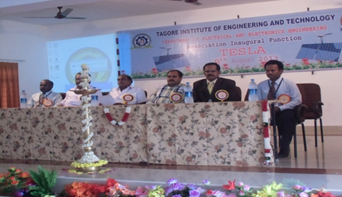 The chief guest Dr. A. M. Kalpana, Professor/ HOD, Department of Computer Science and Engineering, Government College of Engineering, Salem delivered her inauguratal address of TESLA. In her lecture, validate your plans because more than planning executing is important. More than the execution, monitoring is important. Enhance your competence and become SMART. “SMART” implies soft skills mater, aptitude and attitude, reading and transformating. Mr. P. Rajeshkumar HOD/ECE Presented the vote of thanks. The department of EEE organized one day National level seminar on “Computer Technical Training Program” on 28th August 2017. Our department staff Mr. K.Venkatesh welcomed the gathering. Mr. A. Chinnathambi,	CTS, Technical Trainer, Hardware Training and Software Development Centre, Attur. Emphasis shall be laid on topics relevant to computer hardware and servicing, windows installation and networks. In networks basics of networks, IP address, switch and router device, cable crimping with tools, sharing of data in networks, and remote connection. The topics covered in this seminar are useful in their academic curriculum also. Our department staff Mr. S.Subramanian, Assistant Professor / EEE presented the vote of thanks. The department of EEE organized one day National level seminar on “Electrical System Design” on 29th August 2017. Our department staff Mr. K. Venkatesh welcomed the gathering. Mr. N. Shanthi, Senior EDA Engineer, A division of CADD Centre Training Services, Salem. Emphasis shall be laid on topics relevant Electrical System Design, and Product analysis using MATLAB, Disease identification in human being and agriculture area, usage of embedded software, and thief identification by using MATLAB, circuit design on chip and neural network. The topics covered in this seminar are useful in their academic curriculum also. Our department staff Mr. K. Saravanakumar, Assistant Professor / EEE presented the vote of thanks. The department of EEE organized one day One Day Workshop “Hands on Training in Renewable Energy System Using MATLAB 2013a” on 08th September 2017. Our department staff Mr. K. Senthil kumar welcomed the gathering. Ms. S. Poovizhi, Project Engineer, Mr. S. Satheeshkumar, Project Engineer, UNISO SYSTEM INDIA (P) LIMITED, Salem presented a brief lecture on introduction and basic fundamental of Power Electronics Converters, Inverter is used in various industry applications. They are also demonstrated and simulated various types of power converter and inverters with renewable energy systems using MATLAB 20163a, Followed by Hands on Training given to all students should practice various converter and inverters interface with hybrid energy systems. The topics covered in this seminar are useful in their academic curriculum also. Our department staff Mr. J. Dhamodharan, Assistant Professor / EEE presented the vote of thanks. Our department has organized two days Guest Lecture Programme for the Topics “Control Systems” on 22.09.2017 & 23.09.2017. All the third year EEE students were participated in this Program. Guest lecturer Ms. C. Hemalatha, M.E., Assistant Professor, Department of EEE, Gnanamani College of Technology, Namakkal, specializes in the field of Control System area. The guest lecture provoked a keen interest among the student. Our third year EEE students were benefited up to a large extent. New way of teaching method was adopted for delivering the lecture. It was learning and interactive session for the students when answered all the queries put up by the students to their full satisfaction. The students find this session very useful in their curriculum of the semester. The technical lecture began with a short review of some fundamental concepts of Electromagnetic fields like Maxwell’s equation, Boundary condition, Waveguides, pointing vector and various problems solved in magnetostatics, electrodynamic fields to the students in a captivating manners which was very well liked and appreciated by all the attendees. The guest lecture provoked a keen interest among the student. It was learning and interactive session for the students when she answered all the queries. The seminar was effective and students were benefited largely. The students find this session very useful in their curriculum of the semester. Our department has organized one day guest lecture on 27.09.2017on the topic “Microprocessors and Microcontroller”. All the third year students of EEE were participated in this seminar. Mr. K. Karthikeyan, Teaching Fellow/ECE, University College of Engineering Arni, Thatchur, Arni, specializes in Microprocessors and Microcontroller and Advanced Microprocessors and Microcontroller. The aim of the guest lecture is to provide industrial applications and programming concepts in 8085, 8051 of Microprocessors and Microcontroller. His vast experience and knowledge is reflected in the lecture. This seminar acquainted the student with the architecture, interrupting modes and their characteristics, instruction sets, addressing modes, memory mapping, timing diagrams and comparison to programming concept with 8085 in a very meticulous manner. The guest lecture provoked a keen interest among the student. Students were benefited up to a large extent by the practical exposure. It was learning and interactive session for the students when he answered all the queries put up by the students to their full satisfaction. The seminar was effective and students were benefited largely. The students find this session very useful in their curriculum of the semester. Our department organized One Day National Level Technical Symposium “TESLA 2K18”on 31.01.2018. The inauguration function was started at 10.30 am sharply, with a warm welcome address given by Ms .S. Jayanthi, Head of the Department (EEE). Our Joint Secretary Thiru.R.Muthusamy sir deliver Presidential address and honored the chief guest. Our Educational Committee Member Thiru.N.R.Palanivel felicitated the gathering. The principal Dr. S. Senthilkumar deliver the principal address. Student Secretary Mr. G. Ramesh of Final year student gives the Introduction about to the chief guest. Our chief guest Mr. M. Sankar presented valuable speech to encourage our students for their betterment carriers in various Electric field and Technology. Our inaugural function was ended and the next session of paper presentation event started at 11.20 am. Students from various colleges presented their papers in innovative topics in different areas like Renewable energy sources and Recent Trends in Electrical Engineering Robotics, Recent trends in power system, HVDC & Smart Grid Power Systems, IOT, etc., After the lunch the interesting events like circuit debugging, technical quiz, Short Film, Multimedia were conducted. Students participated in these events with full involvement and made those events interesting. The valedictory function started at 3.45pm and the participants from various colleges gave their oral feedback regarding the function. Our Joint Secretary Thiru. R. Muthusamy sir and Dr. S. Senthil kumar Principal, TIET issued the prize and certificates to the winners of various events. Our professor Dr. S. Surendiran, presented the vote of thanks. Our department organized one day national level technical workshop “LED light assembling and manufacturing technology” on 23.03.2018. Our inaugural function started at 9.30 am sharply. Head of the Department Ms. S. Jayanthi welcomed the gathering. Our beloved Principal Dr. S. Senthilkumar delivered the principal address, our honorable President Thiru R. Lakshminarayanan sir gives the presidential address and encourage the student carrier betterment such a kind of technical workshop conducted in EEE department and our respected Educational Committee Member Thiru N. R. Palanivel sir to felicitate the gathering. Our chief guest Mr. R. Elavarasan presented a valuable speech regarding LED light manufacturing technology, types, assembling, trade marketing and enterprenership etc. The next session of LED lamp assembling started at 1.30pm. Students from various engineering colleges participated in this workshop. All participants have their own involvement and assembled a new LED lamp. The valedictory function started at 4.00pm and the participants from various colleges gave their oral feedback regarding the function. The principal distribute certificates to the participants. The student vice president Mr. G. Ramesh final year presented the vote of thanks. Rs. 54 Lakhs has been invested for EEE Lab. Dept. of EEE inaugurated their Dept. Association on 19-09-2015 and conducted a Technical Seminar on “Electrical Energy Conservation and safety”. Dept. of EEE conducted a National level technical symposium on 12th march 2016. Our faculty members J.Dhamodharan and L.Karthik produced 100% result in April/May 2015. 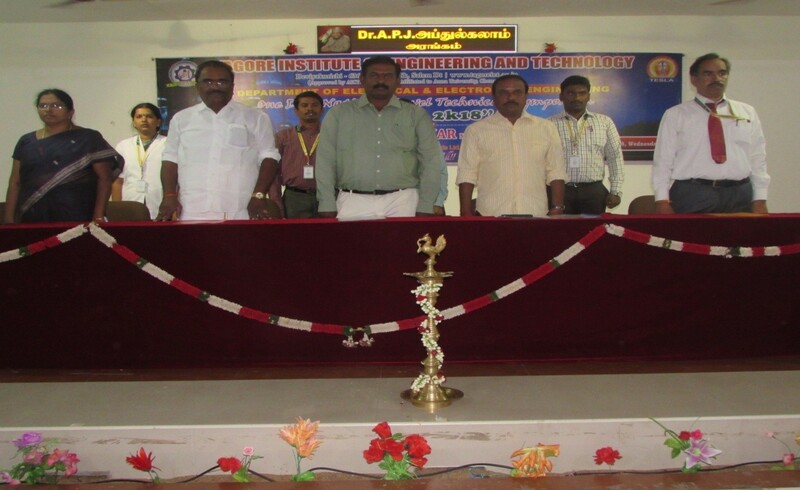 Our faculty members K.Senthilkumar and K.Venkatesh attended Faculty Development Programat MuthayammalEngineering College from 22-06-2015 to 28-06-2015. Our faculty L.Karthik attended Faculty Development Program at VellalarInstitute of Engineering and Technology from 17-12-2015 to 19-12-2015. Our dept. has arranged industrial visit to Thottapetta tea factory and Radio Astronomy Centreat Nilagiri. Our 3rd year students Naveenraj.V and Vignesh.S.P got 1st prize in the event treasure hunt at MuthayammalEngineering College. 10 students have Presented Papers on various topics in various colleges. 2 students participated in Quiz and circuit debugging in various colleges. 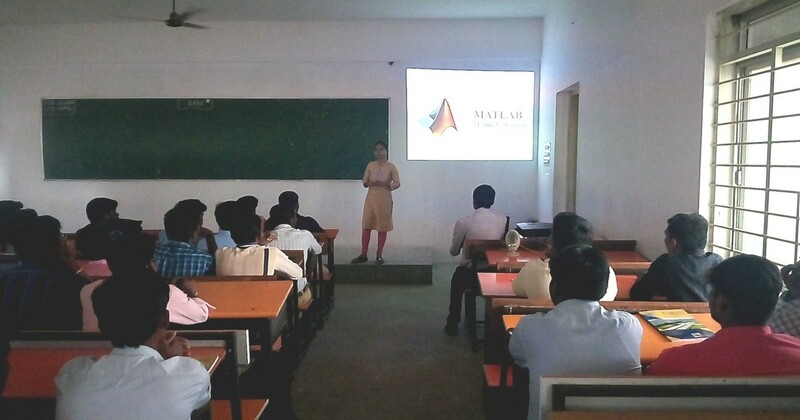 5 studentsattended Workshop and seminar in various colleges. 9 students were underdone an Inplant Training at TNEB Chinnasalem . The department has organized seven programmes in this academic year 2016-17. The department student association “TESLA 2k17” was inaugurated on 19th august 2016.The Chief Guest Dr.G.Tholkappiaarasu,Principal, AVS College of Technology Salem. The department EEE organized One Day National Level Technical Symposium “TESLA 2K17” on 10.02.2017. The chief guest Dr.N.Stalin Associate Professor, Department of Petrochemical Technology, Anna University, Tiruchirappalli. The department of EEE organized one day National level workshop on “Industrial Fire and Safety” on 11th FEB 2017. The chief guest.Mr.N.Chandraraju, Advisor, Sri Vijaya Fire and Safety Company, Trichy enumerated various causes of fire accidents, stages and types of fire. The important causes which include careless handling of fire by men, oil leakage and Electricity leakage were discussed in detail. A one week value added course on” Industrial Automation using PLC and SCADA “ has been successfully conducted by our department. All the final year students of EEE were participated in this value added course. Resource person Ms.S.Poovizhi project Engineer, Mr.P.Raguvaran, project engineer, Uniso System India(P) Limited, Salem. Topics covered in this value added course are useful in their academic curriculum also. EEE department staff members prof. K.Senthil kumar, prof. L.Karthick attened seven days faculty development Training programme on “control systems” at Muthayammal College of Engineering, Rasipuram from 20.06.2016 to 26.06.2016. EEE department staff members Prof. K.Senthilkumar, Prof. L.Karthik, Prof.S.Narmadha, Prof.k.Balasubramanium, Prof.S.Subramanian Prof.M.Satheeskumar presented various papers in one day National Level Conference at “The Kavery Engineering college, Salem on 30.9.2017. EEE department staff members prof. L.Karthik presented paper ” Maximum power point tracking of solar pv array fed water pumping system” in one day International level conference at Vivekananda college of Engineering for women, Tiruchengode on 08.03.2017& 09.03.2017. EEE department staff members prof. J.Dhamodharan, prof. L.Karthik presented paper ” performance comparison of mirror reflected solar panel with tracking and cooling” in one day national level conference at cheran college of Engineering, karur on 17.03.2017. EEE department staff members prof. K.Senthilkumar,presented paper “ liquid level control system with wi-fi access” in one day national level conference at Cheran College of Engineering, karur on 17.03.2017. During this academic year, Our Department has arranged two days Industrial visit for final year and third year students to Kerala, visit to chips system software and anna alunium company on 26 & 27.08.2016. Second year students went to Ooty for the purpose of industrial visit to the company Radio Astronomy centre on 27.08.2016. 9 students of our EEE department participated one day workshop in “ Advanced Industrial Automation-PLC & Control Panel Wiring “ conducted by Axis global Institute of Industrial training in association with Department of EEE at Muthayammal Engineering College, Rasipuram held on 19.9.2016. 8 students of our department has participated in one day National Level Technical Symposium conducted at Al-Ameen Engineering College, Erode on 23.8.2016. 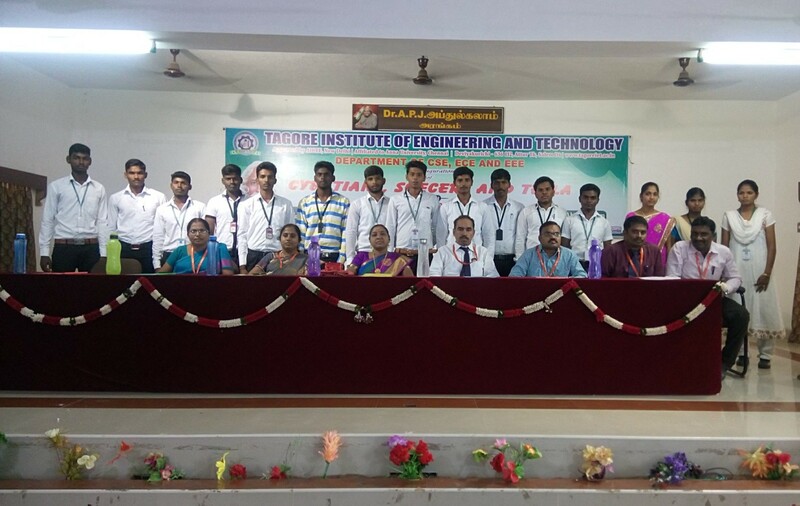 10 students of our department have attended one day National Level Technical symposium conducted by Gnanamani College of technology, namakkal on 24.08.2016. 2 students of our department have attended one day National Level Technical symposium conducted by The Kavery Engineering College, Mecheri, Salem held on 2.9.2016. 9 members have attended the one day National Level Workshop on “Embedded and real time system” organized by Department of ECE at Dhanalakshmi Srinivasan Engineering college, Perambalur in association with pantech ProED private limited, Trichy held on 22.9.2016. 2 students has participated in the one day National Level Technical symposium conducted by Knowledge Institute of Technology, Kakapalayam, Salem on 27.9.16. 5 students have attended the one day workshop on “PLC Training and Industrial Automation” at University College of Engineering, Banruti held on 28.9.2016. 2 students has participated in the one day National Level Conference at The Kavery Engineering College, Mecheri, Salem on 30.9.2016. 8 candidates attended one week Inplant Training at Uniso Systems India Private Limited from 28.11.2016 to 2.12.2016. 8 students from final year attended one day workshop on “ Advanced Trends in Embedded Technology” at united info solution, Salem held on 25.02.17 to 26.02.2017. 6 Students from Final year attended value added course on “ Advanced Trends in computer technology” at Uniso System India(P) Limited, Salem held on 04.03.2017 to 05.03.2017. 16 Students from Third year and Second year attended value added course on “ Advanced Trends in Embedded technology” at Uniso System India(P) Limited, Salem held on 04.03.2017 to 05.03.2017. 6 candidates has participated in the one day National Level Technical Symposium in PSV College of Engineering and Technology held on 3.3.17. 6 students has participated in the one day workshop on “Power Quality Audit Methodologies and Tools” organized by IEEE students branch at Dr.Mahalingam College of Engineering and Technology, Pollachi, coimbatore held on 11.3.17. 21 students have participated in the national level technical symposium organized by the society for the advancement of EEE at Government College of Engineering, Salem held on 14.3.2017. 5 students have participated in the one day workshop on Product Life Cycle and Green Incineration organized by Green Club-Government College of Technology, Coimbatore held on 17.03.2017. Final Year students V.Vignesh, V.Naveenraj, C.Subash have presented various paper in one day National Level Conference at Cheran College of Engineering, Karur on 17.03.2017. 96% of Our EEE Department final year students have placed in various companies during this academic year 2016-2017. I am very glad to inform our EEE Department final year students are doing two Real Time Projects for the welfare of our institutions. Our management encourages the students to contribute towards our students projects Rs.5000 for each one.